10 out of 10 (100.00%) customers would recommend this product to a friend. I am very satisfied how well the cartilage works. I have had consistent quality with this product. Occasionally the cartridge has a conflict with my C5550 printer but Ink Technologies has always replaced the cartridge with no problem. I would recommend this product to home users. Great prices, quick shipping, easy transactions! Great product, I recommended the product to in-laws now they are having me buy them ink. 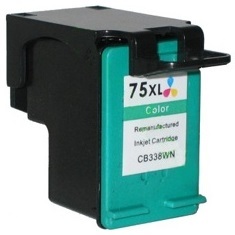 I've used Cartridge World for years & it's great to have an alternative for my ink cartridges..this cartridge is 25% less than I usually pay at CW & works just as well..I'm definitely your newest customer.. Surprisingly good quality. As good as the original manufacturer's version. And great value for the price--less than half the HP price for the same thing. Great website has everything you need as for ink and very easy to order and fast delivery! First order from Ink Technologies and I'm extremely pleased. The entire order arrived in record time, and the ink colors and print quality are exceptional. I would definitely recommend their products to anyone wanting to save money on printer ink and toner!